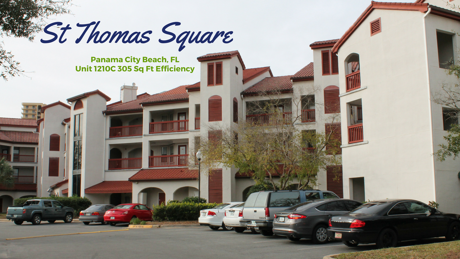 The Best kept SECRET in Panama City Beach...St. Thomas Square (STS)! STS is a Grand Lagoon waterfront property with a boat dock and Gulf access–about 20 minutes to the pass. And it's only a block to the BEACH! This efficiency makes a great beach retreat that can pay for itself when you're not using it. HOA ($410 est. ), property taxes ($550 est. ), and insurance ($600 est.) is reasonable. It had a $10K renovation a year ago. A new, bright and roomy shower, new vanity with storage, new flooring, painted, keyless entry handset, and kitchenette. It has a sitting area with new loveseat that you won't find in any other efficiency. It's fully furnished and ready for both personal enjoyment and profit. This unit grossed $8050 in 2018! It rented for $75 a night during high season. The last efficiency sold was not furnished, not updated, and the kitchenette was a wreck (see MLS 678142). You can see all St Thomas Square condos for sale HERE!